A sharp eye and keen curiosity turned up only the second Brahminy blind snake documented in coastal Georgia. Brunswick resident Lori Parker was sweeping wet leaves from her patio April 13 when she picked up a mat and saw a few earthworms underneath. Top returns pointed to Brahminy blind snake. UGA and DNR staff confirmed the species, the first in Brunswick since DNR Nongame Conservation Section biologist Clay George discovered a Brahminy in the same neighborhood in 2008. Although originally from southeast Asia, the species is now widespread in warmer climates worldwide, including in Florida. It has been carried to foreign lands via imported plants. The expanding range is not cause for alarm. Negative impacts on native species have not been seen in the U.S.
Brahminy blind snakes are, of course, blind. They live underground and eat termite and ant eggs, larvae and pupae (video). Adults grow no longer than about 6.5 inches. The species is parthenogenetic, producing embryos without fertilization. All specimens collected have been females. And on May 7, Parker collected another blind snake in her yard. South Georgians who find a Brahminy are encouraged to send photographs with details to Jensen. Lori Parker’s ID is spot-on: Looks like an earthworm, moves like a snake. If you look even closer, you’ll see the Brahminy stick out its tongue. Also unlike earthworms, this snake is not segmented and does not contract. 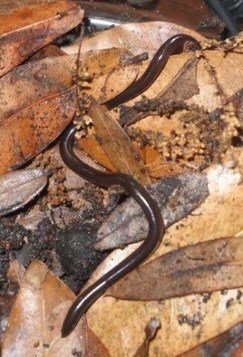 As for distinguishing a Brahminy blind snake from other Georgia snakes, the species has a fairly blunt tail, its eyes are almost invisible and its belly scales look the same as the scales on its back. For more on Georgia snakes, check out “Amphibians and Reptiles of Georgia” (UGA Press). The spring migration is dwindling to a trickle. Over the past weeks, millions of migrating birds streaming from winter homes in the Caribbean, Mexico, Central and South America have passed through Georgia. Although I didn't see many of them, I am sure a smattering stopped briefly in my backyard to rest and refuel. Fortunately, among the visitors I did see was one of the most beautiful of all northbound migrants – the rose-breasted grosbeak. 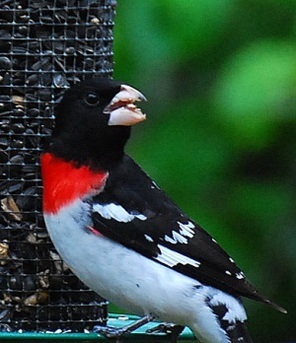 If you ever see a male rose-breasted grosbeak, you will never forget it. Read Terry’s complete column to learn more about these striking migrants, including how to attract them, why they’re sometimes called the potato bug bird and how a grosbeak once tripped up Audubon! Terry W. Johnson is a former Nongame program manager with the Wildlife Resources Division and executive director of TERN, the Nongame Conservation Section’s friends group. “Out my backdoor” columns archive. When Taylor Glover granted a protective easement for Tallassee Forest to the Oconee River Land Trust, Glover became eligible for an income tax credit and Georgia wildlife received a windfall. His donation protects more than 500 acres of Piedmont hardwood forest in Clarke County. 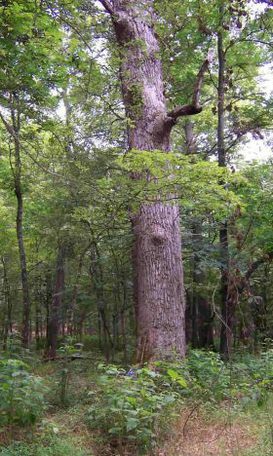 The property features one-and- a-half miles of Middle Oconee River frontage and massive trees, such as a tulip poplar that measures 54 inches in diameter (right). "I hope it inspires others to do similar projects," Glover said during a recent event Athens Land Trust held to honor his generosity. Tallassee Forest was one of 177 tax credits approved in 2012. Those credits protected 70,000 acres. This success is due in part to the incentive provided by the Georgia Conservation Tax Credit Program. Landowners who protect natural resources by donating land or permanent conservation easements to a government or qualified organization can receive credits against their state income taxes. Rule changes at the end of the year that tightened qualifying requirements also spiked interest. The 177 applications received in 2012 were double the typical year since the program started in 2006. Here's a closer look at the numbers. Of the 70,000 acres, about a quarter of the acreage was in the Piedmont. The Blue Ridge, much of which is already protected in national forest, had a smaller fraction, as did the lower Coastal Plain. The Southeastern Plains physiographic region, the western part of Georgia’s Coastal Plain, had the largest share – nearly 38,000 acres protected by conservation easements. Most of the largest properties were in this region. Protection of agriculture and forestry lands was the most-cited of the seven conservation purposes used to determine credits. Protecting water quality and wildlife habitat ranked second. Seventy-eight of Georgia’s 159 counties had tax credit properties. Northwest Georgia counties had the most. Georgia Land Trust led in donations received, at 90. Atlantic Coast Conservancy followed with 34. State and local governments received nine, some of them fee-simple land donations. Conservation sites ranged from as small as 3 acres in urban areas to more than 4,000. Five applications involved 2,000 acres or more. Looking ahead, new rules stipulate that not one but two conservation purposes must be met for qualifying sites. But in 2012, only 24 of the 177 credits granted met only one purpose. Most met three. The Tax Credit Program remains an important incentive for protecting conservation lands. Potential donors can be inspired by the recent swell of private conservation activity throughout the state, such as the easement that will keep 500-plus acres near Athens unchanged for generations to come. Chris Canalos, a GIS specialist with the Nongame Conservation Section, administers the Georgia Conservation Tax Credit Program. The sea turtles are coming, at least those ready to start laying eggs on Georgia beaches are. Nesting for the state’s primary sea turtle – loggerheads – begins this month. 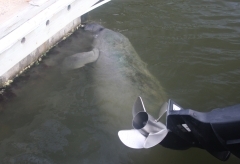 Boaters on the coast are encouraged to watch for sea turtles and manatees. Boat strikes are leading cause of death and injuries for these protected animals. Three of the 10 sea turtles found stranded during a recent week had been hit by a boat. Sheffield Wildlife Management Area has grown by 1,050 acres. The Howell Tract features globally rare montane longleaf pine and mature hardwoods in forests that help protect Raccoon Creek, home to federally listed Etowah and Cherokee darters and part of a State Wildlife Action Plan high-priority area. The two peregrine falcon nestlings at SunTrust Plaza in Atlanta were recently banded by DNR’s Jim Ozier (video). Now 4 weeks old, the young – both females – will leave the nest in about weeks, a coming of age the public can watch and discuss at DNR’s falcon cam site. See why peregrines rate as the world’s fastest animal in this National Geographic video. The red-cockaded woodpecker count is going up at Silver Lake Wildlife Management Area and two Safe Harbor plantations in the Red Hills region. As of early May, Nongame Conservation Section biologist Joe Burnam had found 20 nests and banded five nestlings at the sites. The Safe Harbor Program has enhanced southwest Georgia’s population of these endangered birds. Snail darters were recently documented in South Chickamauga Creek in Graysville. The sampling, done by Nongame’s aquatic staff, marks the first time the federally listed fish has been captured in Georgia since 1980 and the largest collection – 12 – ever in the state. Chalk up more botanical gems for Oaky Woods Wildlife Management Area near Warner Robins. While preparing for a timber harvest to enhance remnant prairie habitat at the WMA, Nongame senior biologist Nathan Klaus found buffalo clover – known from only a handful of sites in Georgia – and shooting star, uncommon in Georgia and the first site documented in the Coastal Plain. 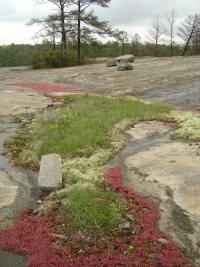 Rare plants and the granite ecosystems they inhabit at Arabia Mountain are the focus of a sunset hike 6-9 p.m. May 18. Free and open to the public, the event sponsored by the U.S. Fish and Wildlife Service and held by Davidson-Arabia Mountain Nature Preserve will highlight recovery efforts for federally listed mat-forming quillwort and pool sprite. Shooting a great blue heron on a Fulton County golf course has the suspect facing more than one penalty. Ranger First-class Chad Cox and Cpl. Will Smith charged the shooter with taking a protected species, while Roswell police added one count of discharging a firearm in the city limits. The range-wide strategy for conserving gopher tortoises is online. Developed by the U.S. Fish and Wildlife Service with six states – Georgia included – and a Southeastern Association of Fish and Wildlife Agencies committee, the strategy will guide efforts to keep the gopher tortoise around for generations. Eastern spadefoot toads were in a breeding frenzy May 6 at the State Botanical Garden of Georgia. The loud event at the Athens garden, spurred by more than 3 inches of rain (heavy rain is the species’ cue for breeding), is captured in this video by 10-year-old Owen Donnelly.